Let’s start with the pros of Whitcoulls’ recently launched e-reader device, the Kobo. Weighing in at 221 grams, it is surprisingly light. It will definitely fit in your bag or even in biggish pockets, making it perfect for reading anywhere — at home, in cafés or while travelling. The Kobo is powered with USB and has a great battery life — up to two weeks, or around 8000 page turns, according to Whitcoulls. I found it quite comfortable to read from. The Kobo uses e-ink technology, with a background similar to the look of recycled paper, rather than a back-lit one. This gives the screen a high contrast appearance and keeps power consumption low. It features a six-inch display screen with the choice of five font sizes. The Kobo has a quilted, slightly rubbery back that I liked and it sits nicely in your hands when reading. This turned out to be a matter of taste, though. My colleague across the partition immediately took a dislike to the back of the device, saying it looked like a bad velvet couch from the 1970s. Now for the cons. Operation-wise, the Kobo is somewhat disappointing, at least to tech geeks. It does not have the touch-screen technology we have almost learnt to expect. Instead, it has a four-way directional pad for navigation located at the bottom right-hand corner. It also has Home, Menu, Display and Back buttons on the left-hand edge of the device. One annoying aspect in its operation is that with each page turn the screen flicks to negative before going back to normal. On the whole, the Kobo feels like something from the last decade. But, in its defence, it is not trying to be the latest whizz-bang device. It doesn’t have wi-fi, a camera and a built-in coffee cup holder. This is a basic device focused on one thing – being a good e-reader. And I think it serves that purpose quite well. The Kobo has 1GB of storage, allowing it to hold up to 1000 eBooks. If that is not enough for you, a memory card expands this to 5000 books. 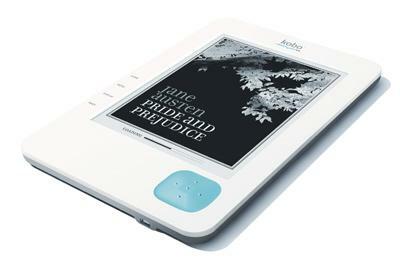 The Kobo also comes preloaded with 100 public domain books and it supports the industry standards ePub and PDF. To coincide with the launch, Whitcoulls recently made an eBook online service available that has more than two million titles to choose from. Customers can download eBooks directly from Whitcoulls’ website to their iPhones, BlackBerrys, Android smartphones, PCs, laptops — and soon, iPads — or their dedicated e-reading devices, such as the Kobo. The Kobo retails for $295 at some Whitcoulls stores and online. New Zealand is only the fourth country in the world where the device has been launched; it is also available in Canada, the US and Australia.